We can accommodate in self catering accommodation up to 22 guests in the manor house and the cottage. An old spiral stone staircase leads to the bedrooms on the 1st and 2nd floors. 4 very comfortable double rooms with ensuite bathroom and 2 apartments are available. Total 7 bedrooms with 7 queen beds and 1 single, 6 bathrooms with bathtub or shower. The other rooms available are a lounge, a bar, a large dining room with a full equipped kitchen and a laundry. A wing of the manor remains at the disposal of the owners. A recently renovated 18th century charming cottage surrounded by the garden and the fields with on the ground floor large living and dining, large old fireplace, a bar with a full equipped kitchen. On the first floor 3 large rooms with 2 queen size beds and 3 single beds (7 pers). 2 bathrooms equipped with shower or bathtub, wash-hand basin, WC, wood floor in bamboo. Patios with tables are available. 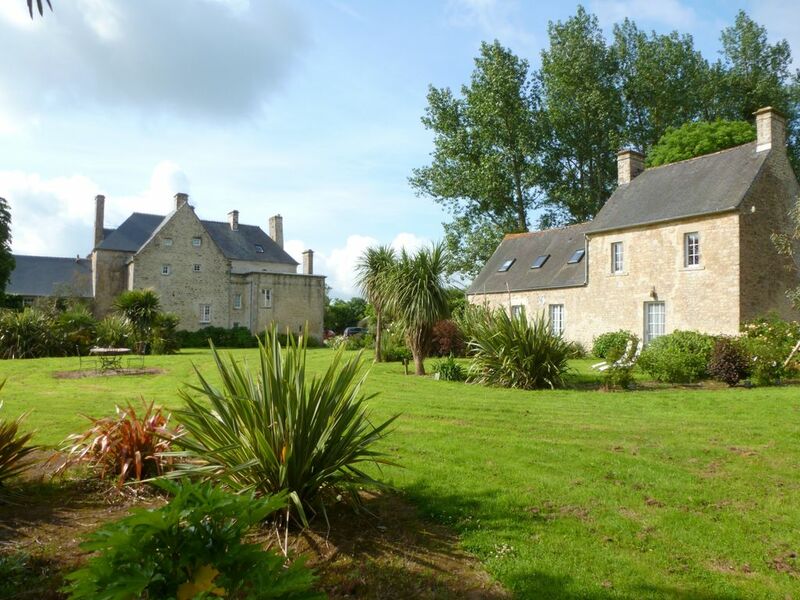 16th century manor house located near Valognes, Cherbourg (ferries) and the d-day beaches with Utah beach , Omaha beach and sainte mere l’église. You will be made very welcome in this property in a quiet environment with 2.5 ha of landscaped garden with a pond. Parking, free Wifi in all the buildings. Restaurants at 3 km. Sea at 15 km. A poplar alley leads to this impressive manor and its genuine farm buildings (cottage, cider-press, old arches and bakery). The central position of the Manor will enable you to visit a lot of interest places: "La cité de la mer" in Cherbourg, the Channel Islands, Jersey and Guernsey, the D-Day beaches and its monuments (20 mn from Utah beach, 40 mn from Omaha beach and 10 mn from Sainte Mère l'Eglise), the Mont saint Michel is 1h30 drive. The main building dates from the 16 th century, but the foundations are still older. Important renovations have been made during the 18 th century. Its setting dates from the Gallo-Roman period and Savigny was joined to the famous roman town of Alauma. The old Roman causeway of Cosedia borders the property. A group of our students stayed here for two nights during a study tour of London, Normandy and Paris. They absolutely loved the opportunity to stay in such a beautiful and historic manor. Eric was very accommodating and helpful, and was easy to communicate with in advance of arrival. The students' only complaint was that they did not have more time here? What a beautiful venue for a long weekend - a chateau in large grounds not far rom the sea. I booked the Manoir de Savigny for a small choir performing a couple of concerts in the local area. Each person was able to have their own room, each of which was very comfortable and beautifully presented. We commented on the quality of the bed linen, which was very luxurious and smooth. The living room was ideal for rehearsing and dining room perfect for communal meals. Our host Eric was very welcoming and helpful and explained that we had the use of the considerable grounds during our stay. We particularly liked the ancient spiral staircase which ended in a little gallery overlooking the pond, and the comfortable bar area where we could relax on the squashy sofas. All in all a perfect place for relaxing, near to interesting towns and wide open beaches. We celebrated 50th wedding anniversary with a week at Manoir de Savigny. 21 family members, including 9 school age cousins, enjoyed every minute. Property is beautiful and spacious, with areas for group to gather as well as have private time. Well maintained houses and garden areas and an attentive host who lives on site. Located near nice town of Valognes and within reasonable drive to othe sites. Travelled from Dorset as a group of 16 and arrived to be greeted by Eric who ran through everything we needed to know. The chateau was beyond our expectations and the rooms were all beautiful and clean with en-suites. The location and surrounding grounds are absolutely stunning and perfect for large groups and families with Utah beach close by. So many private areas in the garden to relax. We would have no hesitation recommending this beautiful place and hope to return in the very near future ourselves. Really cannot put in to words what a wonderful time we had and thank Eric for being a wonderful host. With 22 other family members from Germany, England, Spain and The Netherlands we had the whole property to ourselves for 1 week. Did a lot of dining al fresco, looked for qoypu's in the pond, ate and drank a little too much and totally enjoyed all that this house has to offer. The property is also very easy to reach. In the area you'll find all supermarkets you need, as well as good restaurants and the charming village of Valognes. The coast is nearby. Do go to Nez de Jobourg. Beautiful, and France sort of ends there. Would I like to visit this property again? Yep! D-days landing beaches with Utah beach, Omaha beach, Sainte mère l'église.